The Market is Hot! Or is it??? Homes are selling in 3 days! Rates are going up! It's a great time to buy!!! All three of those statements are generally true, but they don't really tell you what's going on in its entirety and they certainly don't give you enough information to make an informed decision. They are good talking points, but there is a lot more going on behind the scenes than these three statements make it out to be so I will try to address each one individually. Homes are selling in 3 days - partially true. Some homes are selling in 3 days, but certainly not all of them. 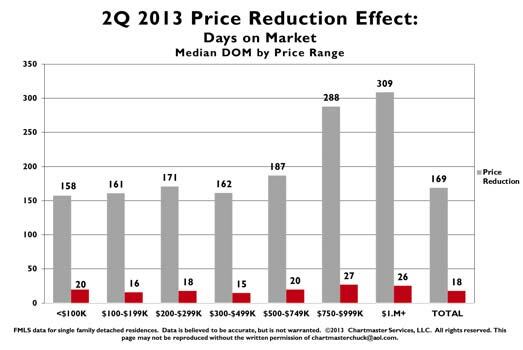 If your home is priced correctly for its condition and location, the average days on market is about 15 days. What's interesting about this is that it doesn't matter what price point we are talking about. In fact, it really doesn't matter which moment in time we are talking about either - even the worst part of the latest downturn in the market. In my view, this is really the first fundamental law of real estate (no, it isn't location because if it isn't priced right for it's condition, it won't sell). If there is a market for your home and it is priced correctly for its condition and location and marketed properly, it will sell in about 2 weeks. For homes between $500,000 and $1,000,000 it's about 21 days and for homes between $1,000,000 and $2,000,000 it's about 28 days and above that all bets are off because the actual market for these homes is quite small (except for Buckhead where the price may be closer to $3,000,000). The question really is what price will it sell for. See chart for more details about days on market. I see these charts every quarter and they just don't change.